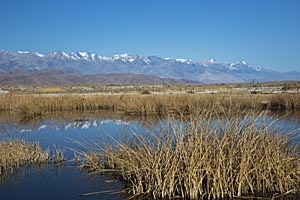 The Los Angeles Department of Water and Power is returning some water to California’s Owens Lake, 100 years after it began diverting water from the Owens Valley to Los Angeles via the 233-mile Los Angeles Aqueduct. The diversion ended farming in the valley and caused the lake to dry up, creating massive alkali dust storms. In recent years, LADWP has been required to mitigate the environmental damage, and it has installed a system of pipes, pumps, and dikes to re-water part of the lake.